congratulations! !...your colorful pieces will be a beautiful contribution. How wonderful to have your work shown in such an appropriate place! Congratulations to all that you have accomplished and that you have found a venue where you can display your art throughout the year. 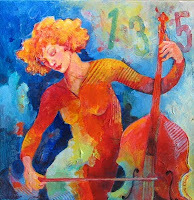 Your art work is very spirited and encompasses the joys of music very well. Thank you Merci and Egmont for your comments. I think it's so fantastic that through the medium of the internet I can get to know people like the two of you, and have the opportunity to learn from and be encouraged by the friendship. This is the first figurative work I believe I've seen of yours with the exception of the Geisha and the Clown. I love it, the color and movement. There is no end to your talent. Congrats on the new hanging space too! Gorgeous painting-- marvelous colors and such feeling! I was caught by your 'new' blog title-- YES! to No Naked Walls. As a child of artists, I always disconcerted to visit the houses of my childhood contemporaries to inevitably see... Blank. Walls. Eeehh! It still freaks me out. It's just Wrong! Thanks for doing your part to set the world straight. Thanks Eva. I actually love figures and faces and would find it fascinating to spend lots of time just painting those however I have been trying to focus more on one theme or idea and that's the reason for the musical works. Perhaps this is a transitional piece that will see me incorporating the figure into my music theme? I liked your comment r garriott. I love to see houses with lots of exciting art in them. It adds so much character and,like books in a bookcase, says so much about the people who live there. A young man came for dinner recently and he was quite amazed to see all the art in the house and afterwards he commented to his family that my house was like a museum or gallery. I guess it's just what you get used to. Hi Susanne - it was my pleasure to pass a Sunshine Award on to you. Your colors and musical imagery are just so beautiful! Dear Susanne, your art work is very, very, very beautifull!!! It's so vibrant, so attractive, so delicate! I love to have find your paintings, while I was searching about painters and musical instruments... A big blue kiss for you!